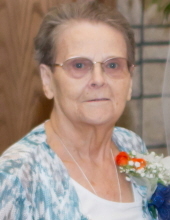 JoAnn I. Juergens, age 82, of Sullivan, Missouri, passed away Saturday, April 6, 2019 at Meramec Nursing Center in Sullivan. JoAnn I. Schowengerdt was born on June 25, 1936 in Columbia, Missouri, the daughter of August John Edward and Catherine Letty (Dennis) Schowengerdt. She grew up and attended school in Columbia, Missouri. On August 20, 1954, JoAnn was united in marriage to Roy E. Juergens and they were blessed with five children: Michael, Kathy, Royanne, Roxanne and Christina. Through the years, JoAnn was employed by Midwest Shoe Company and Sullivan Independent News; however, her most important job was being a mother. JoAnn loved her family, especially the grandchildren and great-grandchildren. She also enjoyed reading, crocheting, sewing for her children, and cooking. JoAnn is survived by her children, Michael Juergens and wife, Nila, of St. Peters, MO, Kathy Hake and husband, Dale, of St. Peters, MO, Royanne Newbanks of Sullivan, MO, Roxanne Slezak and husband, Tom, of Sullivan, MO, and Christina Schatz of Sullivan, MO; ten grandchildren, Michelle Ruether and husband, Mike, Rachel Witt, Brett Newbanks and wife, Theresa, Brad Newbanks and wife, Angie, Mallory Farrell and husband, Ross, Kylie Record and wife, Jill, Keith Slezak and wife, Julie, Andrea Moore and husband, Peter, Dylan Schatz and significant other, Hannah Huedepohl, and Alex Schatz; 14 great-grandchildren, Cade, Emma, Brendon, Colby, Kent, Kase, Reed, Sage, Bryce, Pearl, Paityn, Kelby, Maddux, and Anistyn; 4 siblings, Samuel “Butch” Schowengerdt and wife, Carmelita, of OR, Dennis Schowengerdt of MT, Sandra Reyman of St. Louis, MO, and Penny Whitehead and husband, Lamire, of St. Louis, MO; sister-in-law, Karen Schowengerdt of Mountain View, MO; nieces & nephews, other relatives and friends. She was preceded in death by her husband, Roy E. Juergens; her parents, August and Catherine (Dennis) Schowengerdt; son-in-law, Michael Schatz; one brother, John Schowengerdt; two sisters, Jackie O’Brien and Judy Wilson and husband, Carl; sister-in-law, Tina Schowengerdt; father and mother-in-law, Clarence and Fannie Juergens. Memorial services will be conducted 12:00 noon, Friday, April 12, 2019 at the Eaton Funeral Home in Sullivan, with Mr. Ray L. Schatz officiating. Inurnment will be held in I.O.O.F. Cemetery in Sullivan. The Juergens family will receive friends from 10:00 AM to 12:00 PM, on Friday, at the Eaton Funeral Home in Sullivan. Memorial contributions may be made to Heartland Hospice. Friends may send online condolences to JoAnn’s family at www.eatonfuneralhome.com. To send flowers or a remembrance gift to the family of JoAnn I. Juergens, please visit our Tribute Store. "Email Address" would like to share the life celebration of JoAnn I. Juergens. Click on the "link" to go to share a favorite memory or leave a condolence message for the family.